Jiri Everest Base Camp Trek | Adam Tours & Travel Pvt. 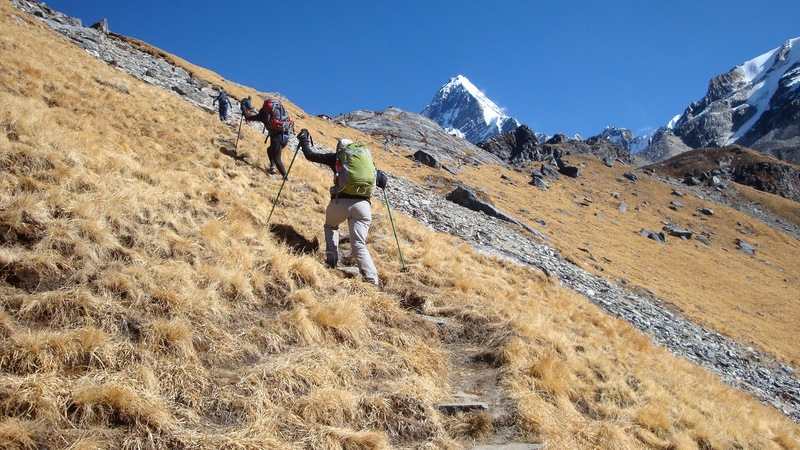 Ltd.
Jiri Everest Base Camp trek is one of the old and most popular trekking route to reach Mt. Everest. The Jiri Everest trekking offers a once a lifetime adventure travel hike in the company of inspiring and breathtaking Himalayan scenery. It is worth pointing out that the walk-in from Jiri offers much benefit through gradual altitude acclimatization as well as a very special experience in getting to know the countryside lifestyle of this region and their Buddhist culture, rather than direct flight to Lukla. This area is mostly populated by hospitable Sherpa, the major attraction of this area are the majestic mountains, the high mountain villages, charming monasteries and congenial people. Some of the highest mountain located in this area is the world tallest mountain Mount Everest, the alpine forests, glacial rivers and amazing rhododendron and pine forests. The trail of this area begins from Jiri to Namche which passes through numerous interesting villages that are now visited by a small number of trekkers each year. While on the trek, we also pass through the alpine forests, glacial rivers, and enjoy the warm hospitality of ethnic people. The trail passes through numerous villages of different ethnic groups. Some of them are Tamang, Jirel, Rai, Brahmin, Chettri and of course the Sherpa’s too. While Visiting the Buddhist monasteries we can view with different prayer flags, the Sherpa and other ethnic villages with their simple yet rich mountain lifestyles. The views are gorgeous mountains, and walking in the Himalayas proves to be quite an intense experience. Jiri Everest Base Camp trekking is best for acclimatize as the trail goes slowly higher and higher, after having rest day at Namche Bazaar, trails continues Monastery which is for famous active at Khumbu Region, Tengboche Monastery where trekkers will be rewarded by the panoramic. some of the peaks that can be viewed in this trek are Everest (8848m), Cho Oyu (8152m), Lhotse (8516m), Makalu (8463m) and AmaDablam (6456m), Thamserkku and many other surroundings mountain. You will also have the chance to have a close look at the spectacular Khumbu Icefall in Everest Base Camp. Jiri to Everest base camp trek is a great adventure trek for the travelers who are physically fit, in good health, and are determined to challenge themselves with unpredictability of mountain life. The trail is not only famous for its proximity to the world’s highest mountains but also for its friendly Sherpa people, picturesque villages, great variety of cultures and traditions, colorful festivals and monasteries. The flora and fauna are other ornaments of the Sagarmatha National Park. The beginning of this trek retraces the route of the earliest Everest expeditions through beautiful Alpine scenery. The trek last for 22 days. This type of trek is for the trekker who wants for real adventurers and looking for a challenging trek crossing some of the most famous high passes in the world, we offer you the best services and hospitality gained from our long experience. We will have a drive for about 7-8 hours from Kathmandu to Jiri over a distance of 187km. It might be a difficult but scenic full day’s bus ride up the Sun-Koshi river valley to the town of Jiri. Jiri is the largest settlement of the Jirel tribe, a Tibeto-Burman people with cultural links to the Sherpa and Sunuwars. We begin the walk with a climb to the ridge top at 2400m and drops down to Shivalaya (1800m). The trek continues with a steady climb through cultivated fields and tiny Tamang villages. The direct route to Deurali climbs a muddy gully up the end of the spur. After crossing a couple of flat wooden bridges, you will begin the steep ascent to the Deurali pass on a winding forest trail. Deurali (2705m)is covered by a grid of mani walls inscribed thousands of times with the Tibetan Buddhist mantra. Spend night at lodges of Deurali. The next day main trail plunges straight down the hillside. After an hour, you will reach the outskirts of Bhandar (2200m), a Sherpa village which is littered witty prayer walls and small Gompas (Buddhist temples). After following the dirt road east you will encounters two suspension bridges at the bottom of the valley. The final stroll is leisurely stroll along the east bank of Likhu Khola, crossing one last suspension bridge to reach kinja (1630m). Leaving back Kinja, the trail begins a steep ascent switching back up almost vertical slope above the village. The trail climbs steeply up a ridge richly forested with oak and rhododendron to Sete (2575m). A small but ancient ihakhang (Buddhist temple) is a worth for visit. Have a good breakfast before you leave Sete. The first half of the day is a long and draining climb to the Lamjura Bhanjyang (3530m). There you are rewarded with frost and often snow along the trail in winter. The trail picks its way through a dripping, moss-cloaked forest of gnarled rhododendron, magnolia, maple and birch tree. If the skies are clear there are distinct views to the white-tipped peaks above Rolwaling. Lamjura Bhanjyang is the highest point on the trek between Jiri and Namche Bazzar. From the pass, the trail makes a long, slow descent to the bottom of the valley through fragrant fir and rhododendron forests. The final stage to Junbesi passes some coloured mantras carved into a rock face and drops steeply through terraced fields. You will have some good views of Mt. Gaurishankar, Number Himal and Dudh Kunda. At the bottom of the Junbesi, the trail crosses the Junbesi Khola on a wooden bridge at 2560m, reaching an important trail junction. The route to Khumbu leads steeply uphill into the trees and landscape with all pines and cows. The first glimpse of Everest, tucked between the snowy crowns of Thamserku (6608m), Katenga (6685m) and so on. The trail turns north and descends through meadows and copses of pines to the hamlet of Salung (2860m). We follow the shepherds’ huts and the hidden route in dense forest with several scenic streams through pines to a large suspension bridge over Dudh Khola at 2510m and ascent through the incant Buddhist Chorten and several Mani. Below Tarkshindu (3071m), the trail descends through the conifer and rhododendron forests alive with birds. The tail crosses picturesque stream and dissolves into the clutter of loose rocks as it reaches Nunthala. From here the descent continues to Dudh Kosi (milk river), so named for the chalky sediment carried down by the river. The first stage drops steeply for an hour through mixed forest and farmland. The trail switches back onwards through fields of barley, wheat and maize to the Rai village of Jubling (1680m). The path took us a slow climb around a ridge to the village of Khari Khola. The Kharikhola is crossed by a drooping suspension bridge at 1930m. The path makes a steep climb to Bupsa (2360m), set among cascading wheat and maize terraces below a dense oak forest.The path ascends through Sherpa villages and a forest inhabited by monkeys, and then winds steeply up and down through the Dudh Koshi canyon to Puiyan. Spend your night in any of the lodge. The trail climbs for about an hour after Puiyan to a ridge at 2800m. Then up to another ridge. Passing through Lukla Airport follow a gentle climb up the mountainside on the left bank of the Dudh Koshi River. Along the way you will have a view of Mt Nupla (5885m), Kusum Kangaru (6367m) and the Mount Kwongde Range. We then take an easy walk for about two hours to Phakding village for the overnight stop and rest of the time stroll around the village for local knowledge. Set in a natural amphitheatre looking across to the jagged ridge of Kongdi RI (6187m), Namche Bazzar is one of the most attractive settlements in the khumbu region. It is an ideal place to spend a rest day for acclimatization at a high altitude before heading off. We will have a full day rest so that we won’t face any problem ahead. Today we make a short acclimatization trek up to Khumjung, a delightful Sherpa village above Namche. You have full day leisure for wonderful panoramic view or stroll around the market You can also enjoy the splendid views of Everest, Ama Dablam, Thamserku, Nuptse, Lhotse, Tawche, and Kwangde and so on. We start our trek with pleasant walk through the forest with magnificent view of mountains. We follow a spectacular path that traverses around the hillside high above the Dudh Kosi River. After walking one hour you will arrive in Phungithanga. The trail climbs past some water-powered prayer wheels and begins a sustained climb through a forest of tall, mature rhododendrons. Look out for musk deer and Himalayan Tahr among the trees. The start of the Tengboche (3870m), the village is scattered across a wide, grassy saddle below a crescent-shaped ridge covered by scrub pines and firs. From the view point at the top of the hill, there are awe-inspiring views of distinctive peaks like Amadablam (6856m), standing proud of the massif containing Everest (8848m), Nuptse (7861m), Lhotse (8501m) and inspiring views of Himalayan giants. Tengboche Monastery, the largest in Khumbu region, is one of the beautiful monasteries as the center for whole Sherpa. Overnight stay at Teahouse. In the morning views of mountain and monasteries are spectacular in Tengboche. From Tengboche we head north and soon cross the Dudh Kosi river by way of a small suspension bridge which spans a deep chasm in the river valley. Follow the trail as far as Orsho and take the lower path along the west bank of the Imja Khola, through the forest of birches conifers and rhododendrons. As we follow the river northward the trails pass through several chortens and mani walls and small villages. Today’s walk offers views of the Mt.Tawache, Ama Dablam and to the north-Pokalde (5741m), Kongma-tse (5820m) and the great wall of Nuptse. Dingboche is also the gateway to Chukung and farther beyond for the most challenging traverses towards Makalu area. We enjoy the beautiful array of fields enclosed by stone walls to protect the barley, buckwheat and potatoes. Overnight stay in Dingboche. The trail follows a downward path to Pheriche village. It joins the trail below thungla beautiful views of cholatse across the valley. After another steep ascend the trail climbs up and over the terminal moraine of khumbu glacier. Today’s walk offers views of the Mt.Tawache, Ama Dablam and to the north-Pokalde (5741m), Kongma-tse (5820m) and the great wall of Nuptse. The path follows a pleasant, grassy valley. Stark and rugged beauty creates almost moonscape campsite at Lobuche a wind swept collection of huts tucked in a narrow meadow between the glacier and the Lobuche peak. Tawoche and Nuptse are particularly spectacularly from Lobuche towering. Stay overnight at lodge. It is around 7-8 hrs trail today. Mornings are usually sparkling and clear and this is the best time to climb the Kalapathar for one of the world’s definitive mountain views. We will be rewarded the 360 degree dramatic panorama views of Mt Everest and surroundings mountains like Mt. Pumori, Mt. Lingtren, Mt. Khumbetse, Mt. Nuptse, Mt. Lhotse, Mt. Ama Dablam, Mt. Thamserku along with many other peaks. You will have an easy walk for about 2hrs to reach Lobuche and continue downhill to Pheriche. Continue down moraine to Dughla and drop to the bridge over the gushing stream that flows out of the glacier. Stay overnight at lodge. We will trek down through the hillside blanketed by rhododendron and juniper trees. Ittakes approximately four hours to Tyangboche. It is a small village with a famous monastery offering you splendid views of Mt. Amadablam, lush green hills and river views. After crossing the suspension bridge over the Dudh Koshi River trek onwards to the Kyanjuma the junction of the trinity ways to Gokyo Valley, Khumjung village and Namche Bazzar. Dense wildlife of some species of Pheasants, Himalayan Griffons, Musk deer and wild goat can be found abundance inside the rhododendron forest. Evening explore small surrounding area with magnificent scenery. The descent from Namche to the Dudh koshi can be the hardest stage of the entire trek. The trail descends over the ridge past rocky cliffs and scattered pines to the tiny village of Toktok. Although the path is all downhill, the unrelenting slope places massive impact on the knees. Once you cross the high suspension bridge, the path runs mostly level. We will work though rhododendron and pine forests with the view of distance snow covered peak before arriving Phakding. Phakding is a crowed place but better for your overnight settlement. It will be just a 3hr easy and gentle trail back to Lukla.The trail drops steeply and runs level through out the day.Enjoying the lush green scenery around and passing through the incredible mountain scenery and local Sherpa village arrival in Lukla. You’ll have time to stroll around the local areas. In the evening you can enjoy a typical Nepalese dinner and cultural show. Adam Travel have made every effort to keep our price as competitive as possible, by still providing an excelling service to our customer. We pay our porters and guide the legal wages agreed with the porters union, our trekking staffs are some of the best paid in Nepal which allow us to attract only the best guides and porters and we have same amount of Insurance for guide and porter which is more than Government fixed amount. All our price are nett and there are no hidden cost everything is clear on cost includes and excludes this is the main reason all our customer are happy from our service. For up to date cost for the trip please contact us.